How to change the default HTML5 VM console port in vSphere 5.5? 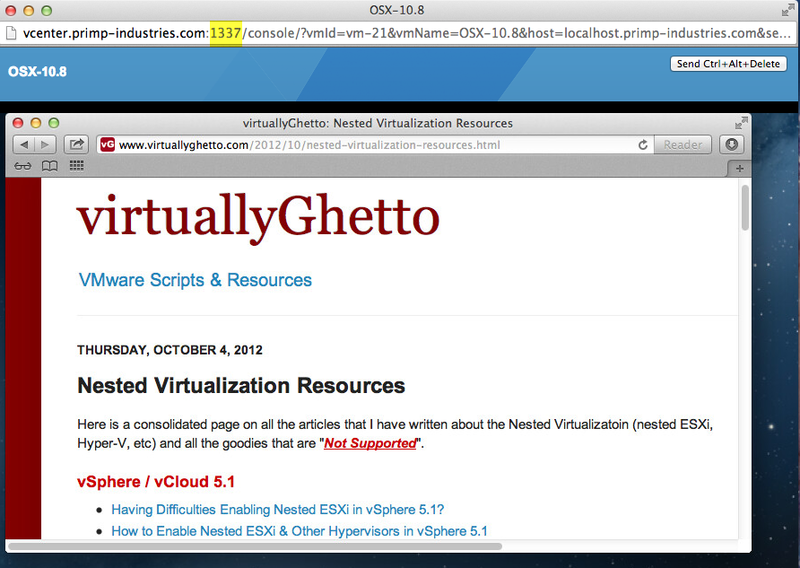 You are here: Home / Uncategorized / How to change the default HTML5 VM console port in vSphere 5.5? 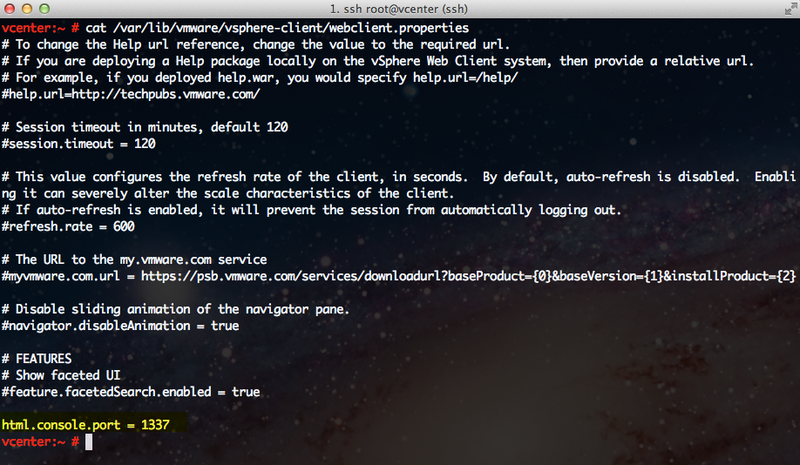 If you have tried out the new HTML5 VM console which is enabled only for a Mac OS X system using the new vSphere Web Client 5.5, you may have noticed it opens up a connection on port 7331 by default. However, this port is actually dynamic and could change if the underlying operating system hosting the vSphere Web Client is already in use. If you are running on the VCSA (vCenter Server Appliance), there is a good chance that this will be the default port but for a Windows based installation, that may or may not be the case. Now if we go back to the vSphere Web Client and open the VM console on a Mac OS X system or generate a URL using the script, you should see the HTML5 VM console is now connecting to the new port. 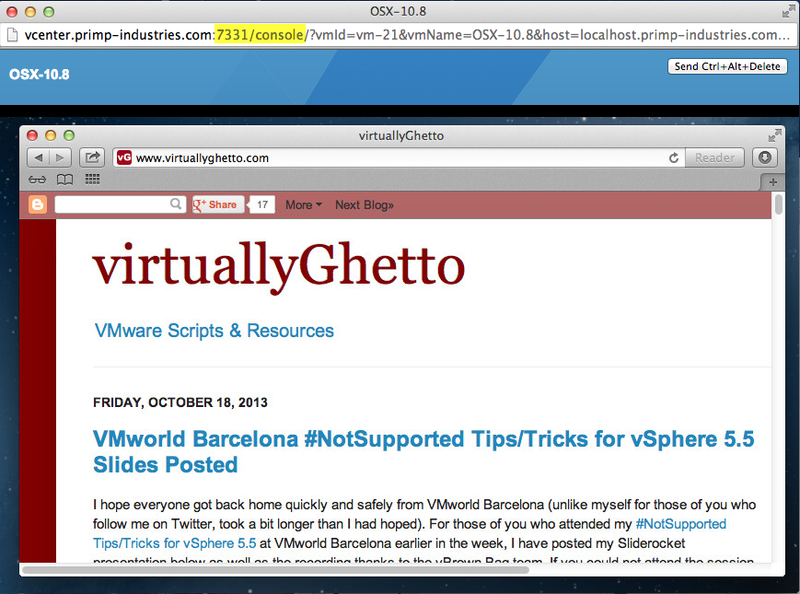 How to generate a pre-authenticated HTML5 VM console link in vSphere 5.5 that works on all OSes! How to audit vSphere Standalone VMRC or HTML5 VMRC connections? How to restrict access to both the Standalone VMRC & HTML5 VM Console? If you need redirect the default port 7343, it is possible? I won´t change it, just redirect.